ARM Smart Design competition winners; Nordic Semiconductor Global Tour details; Emulation alternative; Bloodhound and bridge-building drones; Imagination Summit in Taiwan; Monolithic 3D ‘game changer’; Cadence and collaboration; What size is wearable technology? Winners of this year’s ARM Smart Product Design competition had no prior experience of using ARM tools, yet managed, in just three months to produce a sleep Apnea Observer app (by first prize winner, Clemente di Caprio), an amateur radio satellite finder, a water meter, an educational platform for IoT applications and a ‘CamBot’ camera-equipped robot, marvels, Brian Fuller, ARM. This year’s Nordic Semiconductor Global Tech Tour will start next month, and John Leonard, ARM has details of how to register and more about this year’s focus – the nRF52 Series Bluetooth Smart SoC. Offering an alternative to the ‘big box’ emulation model, Doug Amos, Aldec, explains FPGA-based emulation. Justin Nescott, Ansys, has dug out some great stories from the world of technology, from the UK’s Bloodhound project and the sleek vehicle’s speed record attempt; and a story published by Giz Mag about how drones created a bridge – with video proof that it is walkable. A review of the 2015 Imagination Summit in Taiwan earlier this month is provided by Vicky Hewlett. The report includes some photos from the event, of attendees and speakers at Hsinchu and Taipei. It is with undeniable glee that Zvi Or-Bach, MonolithIC 3D announces that the company has been invited to a panel session titled: “Monolithic 3D: Will it Happen and if so…” at IEEE 3D-Test Workshop Oct. 9th, 2015. It is not all about the company, but a discussion of the technology challenge and the teaser of the unveiling of a ‘game changer’ technology. A review of TSMC Open Innovation Platform (OIP) Ecosystem Forum, earlier this month, is presented in the blog by Christine Young, Cadence. There are some observations from Rick Cassidy, TSMC North America on Thursday, on automotive, IoT and foundry collaboration. How big is wearable, ponders Ricardo Anguiano, Mentor Graphics. Unwrapping a development kit, he provides a link to Nucleus RTOS and wearable devices to help explain what’s wearable and what’s not. A brief history of Calypto Design Systems, recently acquired by Mentor Graphics, is discussed by Graham Bell, RealIntent, and what the change of ownership means for existing partners. Rolling up her sleeves and getting down to some hard work – not just words, Carissa Labriola, ARM, opens a promised series of posts with an intelligent, and through analysis of the Arduino Due and there is even the chance to win one. This is a refreshingly interactive, focused blog for the engineering community. It’s coming to the end of the year, so it is only to be expected that there is a blog round-up. Real Intent does not disappoint, and Graham Bell provides his ‘Best of’ with links to blog posts, an interview at TechCon and a survey. There is a medical feel to the blog by Shelly Stalnake, Mentor Graphics, beginning with a biology text book image of an organism to lead into an interesting discussion on parasitic extraction. She lists some advice – and more importantly – links to resources to beat the ‘pests’. Always considerate of his readers, Michael Posner, Synopsys, opens his blog with a warning that it contains technical content. He goes on to unlock the secrets of ASIC clock conversion, referencing Synopsys of course, but also some other sources to get to grips with this prototyping tool. And in the spirit of Christmas, he also has a giveaway, a signed copy of an FPGA-Based Prototyping Methodology Manual if you can answer a question about HAPS shipments. Another list is presented by Steve Carlson, Cadence, but his is no wishlists or ‘best of’ in fact it’s a worst-of, with the top five issues that can cause mixed-signal verification misery. This blog is one of the liveliest and most colorful this week, with some quirky graphics to accompany the sound advice that he shares on this topic. Frank Schirrmeister, Group Director for Product Marketing of the System Development Suite, Cadence. In general, the industry is experiencing the need for what now has been started being called the “shift left” in the design flow as shown Figure 1. Complex hardware stacks, starting from IP assembled into sub-systems, assembled into Systems on Chips (SoCs) and eventually integrated into systems, are combined with complex software stacks, integrating bare metal software and drivers with operating systems, middleware and eventually the end applications that determine the user experience. From a chip perspective, about 60% into a project three main issues have to be resolved. First, the error rate in the hardware has to be low enough that design teams find confidence to commit to a tape out. Second, the chip has to be validated enough within its environment to be sure that it works within the system. Third, and perhaps most challenging, significant portions of the software have to be brought up to be confident that software/hardware interactions work correctly. In short, hardware verification, system validation and software development have to be performed as early as possible, requiring a “shift left” of development tasks to allow them to happen as early as possible. Figure 1: A Hardware/Software Development Flow. Prototyping today happens at two abstraction levels – using transaction-level models (TLM) and register transfer models (RTL) – using five basic engines. Virtual prototyping based on TLM models can happen based on specifications earliest in the design flow and works well for software development but falls short when more detailed hardware models are required and is plagued by model availability and its creation cost and effort. RTL simulation – which by the way today is usually integrated with SystemC based capabilities for TLM execution – allows detailed hardware execution but is limited in speed to the low KHz or even Hz range and as such is not suitable for software execution that may require billions of cycles to just boot an operating system. Hardware assisted techniques come to the rescue. Emulation is used for both hardware verification and lower level software development as speeds can reach the MHz domain. Emulation is separated into processor based and FPGA based emulation, the former allowing for excellent at speed debug and fast bring-up times as long FPGA routing times can be avoided, the latter excelling at speed once the design has been brought up. FPGA based prototyping is typically limited in capacity and can take months to bring up due to modifications required to the design itself and the subsequent required verification. The benefit, once brought up, is a speed range in the 10s of MHz range that is sufficient for software development. The actual prototype silicon is the fifth engine used for bring up. Post-silicon debug and test techniques are finding their way into pre-silicon given the ongoing shift-left. Using software for verification bears the promise to better re-use verification across the five engines all the way into post-silicon. FPGA providers have been pursuing aggressive roadmaps. Single FPGA devices now nominally hold up to 20 million ASIC gates, with utilization rates of 60%, 8 FPGA systems promise to hold almost 100 MG, which makes them large enough for a fair share of design starts out there. The key advantage of FPGA based systems is the speed that can be achieved and the main volume of FPGA based prototypes today is shipped to enable software development and sub-system validation. They are also relatively portable, so we have seen customers use FPGA based prototypes successfully to interact with their customers to deliver pre-silicon representations of the design for demonstration and software development purposes. There certainly is a fair amount of growth out there for FPGA based prototyping, but the challenge of long bring-up times often defies the purpose of early availability. For complex designs, requiring careful partitioning and timing optimization, we have seen cases in which the FPGA based prototype did not become available even until silicon was back. Another limitation is that the debug insight into the hardware is very limited compared to simulation and processor based emulation. While hardware probes can be inserted, they will then reduce the speed of execution because of data logging. Subsequently, FPGA based prototypes find most adoption in the later stages of projects during which RTL has become already stable and the focus can shift to software development. All prototyping techniques are more and more used in combination. Emulation and RTL simulation are combined to achieve “Simulation Acceleration”. Emulation and transaction-level models with Fast Models from ARM are combined to accelerate operating system bring-up and software driven testing. Emulation and FPGA based prototyping are combined to combine the speed of bring-up for new portions of the design in emulation with the speed of execution for stable portions of the design in FPGA based prototyping. 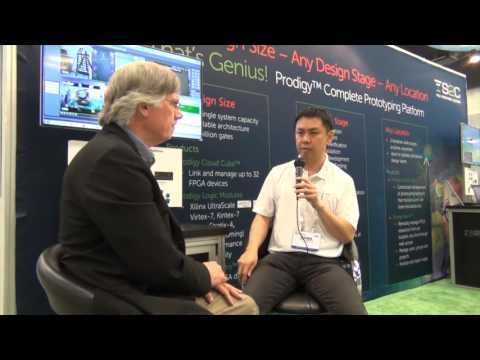 Like in the recent introduction of the Cadence Protium FPGA based prototyping platform, both processor based emulation and FPGA based prototyping can share the same front-end to significantly accelerate FPGA based prototyping bring-up. At this point all major EDA vendors have announced a suite of connected engines (Cadence in May 2011, Mentor in March 2014 and Synopsys in September 2014).It will be interesting to see how the continuum of engines grows further together to enable most efficient prototyping at different stages of a development project. Troy Scott, Product Marketing Manager, Synopsys Inc.
Demand for earlier availability of ASIC prototypes during a SoC design project is increasing because of the effort and cost to develop software drivers, firmware, and applications. Industry surveys show that design teams now spend up to 50% of engineering budget on software development. This urgency is pushing commercial vendors of FPGA-based prototypes to field products that can demonstrate improved productivity for the engineers that are responsible for hardware/software integration and system validation. In this article we’ll examine the state-of-the-art in FPGA-based prototyping tools and the benefits they deliver. Design teams that have adopted commercial FPGA-based prototyping systems versus custom built or adapting FPGA evaluation boards typically do so to stretch the investment dollars over multiple chip designs. Commercial systems tend to be modular and flexible, by stacking or tiling FPGA modules, so that capacity can be scaled up or down for a project’s resource demand and interface peripheral boards featuring interface PHYs can be selectively assembled around FPGA modules. The best commercial systems provide embedded system control elements for rapid programming, FPGA module chaining, clock and reset distribution, heat mitigation, and fault monitoring. All of which contribute to reliability and uptime that is superior to custom-built systems. One of the major tasks of a physical prototype project is to map ASIC RTL and IP into the hardware resources of an FPGA which, in comparison to an ASIC design, provides a limited number of low-skew clock trees and dedicated memory resources. Replacement and substitution can be a time consuming effort to make the RTL “FPGA-friendly.” This is where FPGA logic synthesis tailored for FPGA-based prototypes helps speed the conversion task. Synopsys’s ProtoCompiler, design and debug automation tool, provides two clock conversion techniques for the Synopsys HAPS Series. The first called HAPS clock optimization (HCO) is typically applied very early in the bring-up phase when it’s urgent to get the design operational quickly on the live hardware. HCO automatically chooses a master synchronizing clock and all registered elements are synchronized to it. The conversion is quick and easy since it does not depend on careful identification of clock and data signals or constraints by the prototype developer. When higher performance or asynchronous relationships must be modeled then ProtoCompiler provides advanced clock conversion that logically separates the gating from the clock and routes the gating to the dedicated FPGA clock to enable inputs of sequential elements. Separating the gating from the clock allows a single global clock tree to be used for all gated clocks that reference the same base clock. The Verilog HDL language in the context of a prototyping flow can help address module replacement or exclusion of non-logic elements of the ASIC design. In ProtoCompiler’s design flow for HAPS, the Verilog Force replaces existing driver of internal signals in the hierarchy with new drivers and Verilog Bind inserts a module instance into the design hierarchy. These constructs are ideal for substituting circuitry, changing a clock tree, or to stub out part of an ASIC design that is not needed in the FPGA prototype. The commands when collected into a new file will override the RTL of the design which allows the prototype engineer to make surgical changes to the logic without touching the “golden” source of the RTL drop. Another significant trend in the physical prototyping space is for vendors to deliver prototypes integrated with a CPU software development platform. These combinations are a popular architecture for hardware/software integration scenarios and ideal for software-driven testing and driver development. The reprogrammable FPGA allows for testing of various IP configurations, connecting to analog PHYs implemented on test ICs, and clock, reset, and power management circuit integration between control and PHY. Figure 1 illustrates a commercial implementation of an FPGA-based prototype with a CPU subsystem. The Synopsys DesignWare IP Prototyping Kits take this integration paradigm even further by pre-packaging various IP subsystems from the DesignWare IP catalog with reference drivers and example application running on Linux OS. The kits feature popular interfaces like USB, PCIe, and MIPI and can be assembled, powered on, and running within a few minutes making them ideal for rapid delivery to software developers. The demand for shorter bring-up schedules and more efficient work flows are driving innovations by commercial providers of FPGA-based prototyping tools. Many of the benefits come from the co-design of prototype hardware, firmware, and software elements that help expedite the migration from raw ASIC RTL and IP. Today the state of the art in ASIC prototyping and software development tools join software development platforms running reference designs with pre-packaged IP configurations. Prototyping kits are operational out of the box and allow hardware and software developers to immediately engage in integration and validation tasks necessary to ship the next great SoC design.